Human rabies continues to be endemic in India except for the islands of Andaman, Nicobar and Lakshadweep. The annual incidence of rabies in India is 2/100000 population. About 20,000 people die due to rabies every year in India despite the availability of a potent and safe vaccine. The diagnosis of rabies is often clinical and since the condition is rapidly fatal, investigations like MRI are often not performed. But in many atypical cases the diagnostic dilemma arises between rabies, other forms of encephalitis and acute disseminated encephalomyelitis. Here we describe the clinical and neuroradiological features of a child with rabies encephalomyelitis. This case is being reported to stress the importance of timely post-exposure prophylaxis in all cases of dog bite and the usefulness of imaging in differentiating between rabies and acute disseminated encephalomyelitis. A 12-year-old boy was admitted with history of fever of three days duration, vomiting and pain on the right side of neck, radiating to the right upper limb. He also complained of throat pain and pain on swallowing solids. He had excessive salivation and wanted to spit out frequently but was able to drink, and there was no hydrophobia or aerophobia at presentation. He was bitten by his pet puppy on his right thumb with oozing of blood about 2 months back. The puppy died after a few days, which was not taken seriously. Two weeks back another child in his neighborhood who was also bitten by the same puppy died of classical symptoms of rabies. After this he was administered 4 doses of purified chick embryo vaccine by intramuscular route. Rabies immunoglobulin was not given. On examination, the boy was febrile, with a pulse rate of 92/min and BP of 120/84 mm of Hg. He was conscious and oriented, but was apprehensive and agitated and feared imminent death. There was pain in the neck radiating to the right upper limb, but there was no pain or paresthesia at the site of bite. The right upper limb was weak (Grade 3) and hypotonic with depressed biceps, triceps and supinator jerks. There was no weakness of the other limbs initially. Deep tendon reflexes were normally elicited in the other limbs; he had extensor plantar response bilaterally and meningeal signs were absent. At this point, a provisional diagnosis of rabies vs. ADEM was entertained as there was a definite history of bite followed by a very late and inadequate immunization. A third possibility of other viral encephalitis was also considered while planning treatment. Investigations revealed Hb 11.9, TC 10,700 with P60 and L40, and an ESR of 30. RFT (urea 23, creatinine 1, Na 135, K 3.2) and LFT (S.Br 0.7, SGOT 117, SGPT 29, ALP 222) were normal. He was empirically started on Acyclovir to cover for treatable encephalitis, postponing LP till imaging. Methyl prednisolone was started at a dose of 30 mg/kg/day considering the possibility of ADEM as the illness developed two weeks after anti rabies vaccination. Within 12 hours, the weakness progressed to involve all four limbs, he developed retention of urine and the respiration became shallow. An MRI of the brain and cervical spine performed on a 1.5 Tesla scanner was taken, which showed bilaterally symmetrical hyperintensities in T2 and FLAIR images in basal ganglia [Figure 1], thalamus, dorsal medulla and central gray matter of the cervical spinal cord [Figure 2] extending to the dorsal segments. The next day, he developed the classical symptoms of hydrophobia and aerophobia, and developed respiratory failure. The child was ventilated. But he developed hypotension and shock in spite of vasopressors and succumbed on the third day due to cardiac arrest. A postmortem impression smear of the cornea was positive for rabies antigen by fluorescent antibody test. Further evaluation including brain biopsy could not be done as the parents were not willing for the same. Rabies is an acute, progressive encephalitis caused by a neurotropic RNA virus of the Rhabdoviridae family. The virus replicates in the muscle tissues at the bite site and subsequently infects the motor neurons and travels to the central nervous system by retrograde axoplasmic flow. The acute neurological phase after a variable incubation period (ranging from less than 7 days to more than 6 years) is classically categorized into (1) furious or (2) paralytic type of rabies. ,[ 2] But often atypical presentation and/or a history of vaccination may result in a diagnostic dilemma. Our child presented with features of encephalomyelitis after a bite by his pet puppy about 2 months ago followed by a delayed and inadequate immunization. With this a provisional diagnosis of rabies encephalitis was considered. ADEM was a close second possibility because the illness developed within two weeks of starting anti-rabies immunization, and there was neither hydrophobia nor aerophobia at presentation. MRI showed bilaterally symmetrical hyperintensities in T2 and FLAIR images involving the dorsal brain stem, thalamus and the basal ganglia as well as the central gray matter of the spinal cord almost pathognomonic of rabies. ,, Thus imaging aided the diagnosis of rabies even prior to the appearance of hydrophobia and aerophobia. 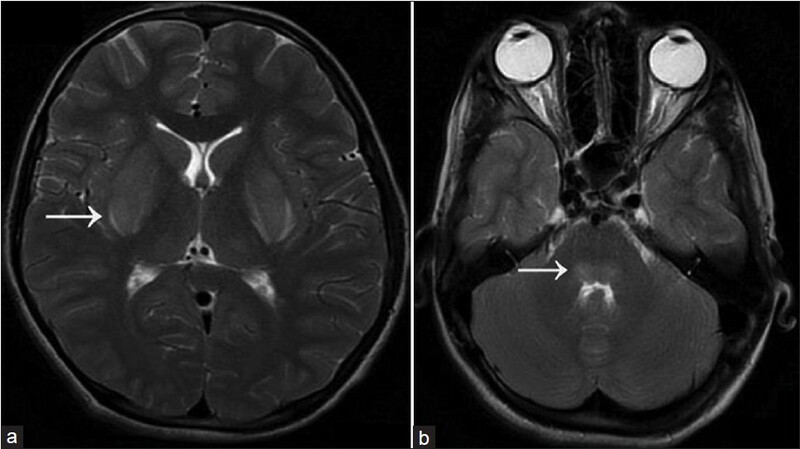 Acute disseminated encephalomyelitis causes bilateral symmetrical hyperintense lesions in T2-weighted images that predominantly involve the white matter of the supratentorial structures, cerebellar peduncle, brain stem and cervical cord. There have been very few reports in India describing the MRI features of rabies probably because it is rapidly fatal. Similar findings in MRI of the brain have been reported by Mohite et al. in a case of rabies encephalitis. Our child in addition also had a spinal cord gray matter involvement. The involvement of hippocampus and subcortical white matter has also been described in rabies, which were absent in our case. The postmortem corneal smear positivity for rabies antigen clinched the diagnosis in this case. 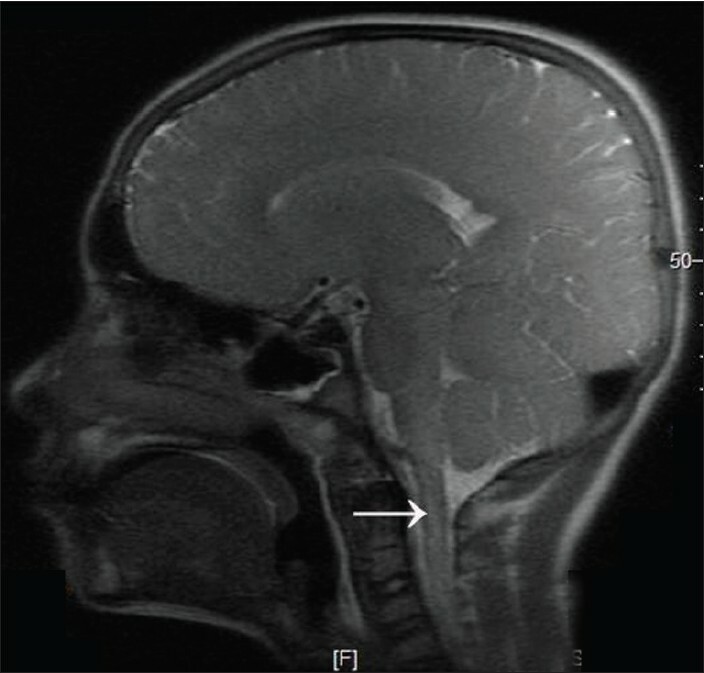 In an endemic country like India, this characteristic clinical or MRI finding of midline encephalitis should alert the physician to the possibility of rabies. Also, an MRI may be a useful diagnostic modality especially when rabies vs. ADEM is considered; with the latter being a potentially treatable condition. Bite by pet puppies shouldn't be taken lightly and greater awareness regarding wound cleaning, post-exposure anti-rabies vaccination and passive immunization with human anti-rabies immunoglobulin should be stressed for prevention of this fatal infection. 1. Madhusudana SN, Sukumaran SM. Antemortem diagnosis and prevention of human rabies. Ann Indian Acad Neurol 2008;11:3-12. 2. Rao AS, Varma D, Rao MV, Mohandas S. Magnetic resonance imaging in rabies encephalitis. Indian J Radiol Imaging 2009;19:301-4. 3. Awasthi M, Parmar H, Patankar T, Castillo M. Imaging findings in rabies encephalitis. AJNR Am J Neuroradiol 2001;22:677-80. 4. Laothamatas J, Hemachudha T, Mitrabhakdi E, Wannakrairot P, Tulayadaechanont S. MR imaging in human rabies. AJNR Am J Neuroradiol 2003;24:1102-9. 5. Mohite A, Prasad V, Rajam L, Madhusudana SN. Rabies encephalitis. Indian Pediatr 2007;44:702-4. 6. Rupprecht CE, Hanlon CA, Hemachudha T. Rabies re-examined. Lancet Infect Dis 2002;2:327-43.